Clinic Synopsis: Be sure to catch Harry's critically acclaimed session covering innovative strategies for successful preparation and performance. This positive, fast-paced clinic provides road maps and tangible guideposts for success for educators and their students. Prepare to be inspired! 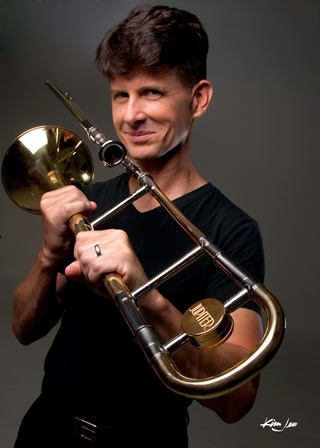 Clinician Biographical Information Internationally known jazz trombonist Harry Watters travels extensively as a Jupiter Artist. His Summit Records releases include Love Songs and three critically acclaimed Brothers discs with trumpeter Ken Watters. After graduation from the Univ. of N. Texas, Harry spent four years with the renowned Dukes of Dixieland. While working at night on Bourbon Street, a sleep-deprived Watters attended the Univ. of New Orleans by day, serving as the grad. asst. to Prof. Ellis Marsalis. Watters has appeared at the American Band College, the Assoc. of Concert Bands Nat. Convention, the International Trombone Festival, the European Trombone Festival and the Eastern Trombone Workshop. In addition, he regularly conducts masterclasses at prestigious universities, conservatories and high schools throughout the US. Harry is married to violist and keyboardist Holly Watters of the U.S. Army Strings. They reside in Alexandria, VA with their children Harry V, Katherine the 1st and Lady Caroline.